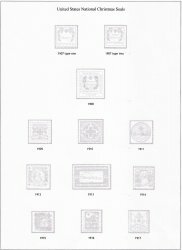 Saint Crispen U.S. National Christmas Seal Stamp Album, 1907-2015 with black and white images. New, album pages printed on 8.5"x11" acid-free 80 lb. card stock. Forty-five (45) pages, provides spaces, with pale b/w images for reference and seal identification, as required, for singles, pairs, blocks, slogan and portrait blocks, booklet panes of 1918, 1930, 1931, 1939, and the 1938 deluxe pane, plus fuul sheets. Saint Crispen U.S. National Christmas Seal Stamp Album, U.S. Christmas Seals 1907 to 2015, with black and white images. This is the Advanced Edition. Forty-five (45) pages, provides spaces, with pale b/w images for reference and seal identification, as required, for singles, pairs, blocks, slogan and portrait blocks, booklet panes of 1918, 1930, 1931, 1939, and the 1938 deluxe pane. Spaces for both types of 1907 seals are provided. Blank, borderless, unpunched, dated pages, are included as placeholders for those years that require full sheets (1970, 1975, 1976, 1977, 1978, 1979, 1980, 1995, 1996, and 1998). Sheet protectors are required and not provided for the full sheets of seals. Printed on 80 lb acid-free ivory, white, or light gray card stock, square corners, with holes punched to fit a standard 3-Ring binder. Saint Crispen Stamp Albums are published by William J Kozersky, Philatelist. Matches both the U.S. National and Local Blank Pages, and the Canada Christmas Seal Albums. This album weighs almost 2 pounds and cannot be shipped by USPS First Class Mail, and does not qualify for USPS Media Mail to domestic locations.